This incredible project has been rumbling on for a number of years, and has at last come to its conclusion. Some of you who follow Hannah on Instagram may have heard the odd snippet of information here and there, but at last (better late than never) we are so excited to reveal the story in full. Three years ago exactly (see THIS blog post) Hannah discovered that she had won a commission from Durham Cathedral. Her self-appointed brief was to design and make a medieval-inspired gold ring, inspired by St Cuthbert's famous gold pectoral cross inlaid with garnets, the carved figures on his coffin, and the myths and legends surrounding St Cuthbert's affinity with animals. The ring is to be included in the displays at the launch of the new Open Treasure exhibition galleries, and afterwards the ring will remain in the Cathedral collections forever. In August 2017, Hannah and her husband attended the evening Private View launch event for Open Treasure - and finally got to see the ring in the exhibition space it was intended for! The ring can be seen in the first part of the displays; in the late 14th century Monks' Dormitory. As you go up the stairs, it's in a window alcove on the immediate left. Hannah hand carved the ring from recycled 18ct yellow gold. It was scaled up in size and dimension, taking inspiration from bishops' rings, so that the ring would stand out more in the display case. It is around a UK size Z+3. With a slight court-shaped profile, the outside face of the ring is engraved with animals found in the stories of St Cuthbert. Inspiration for the naive style of engraving came from the outline-carved figures on the fragments of St Cuthbert's coffin, which dates from the late 7th century AD. 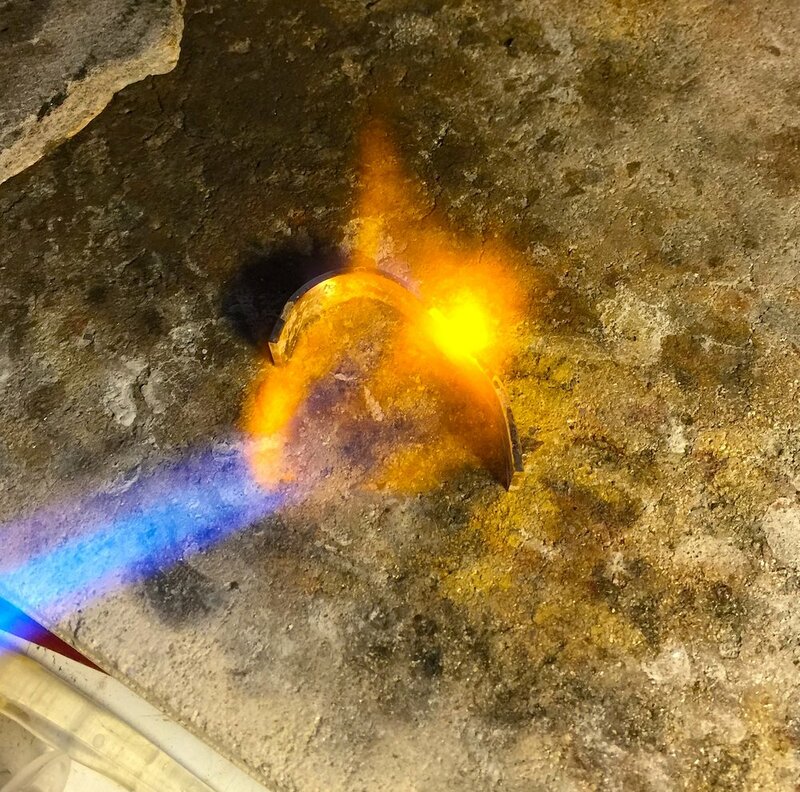 Annealing the heavy gold with a blowtorch to soften it, and allow it to be curved. 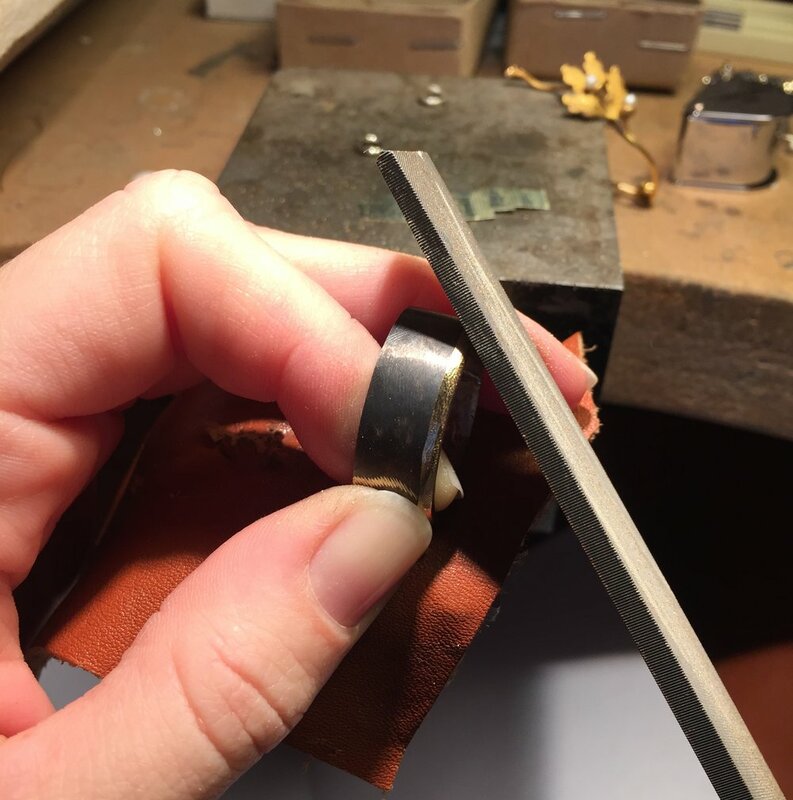 Carving and shaping the ring from the (oxidised) raw 18ct gold. 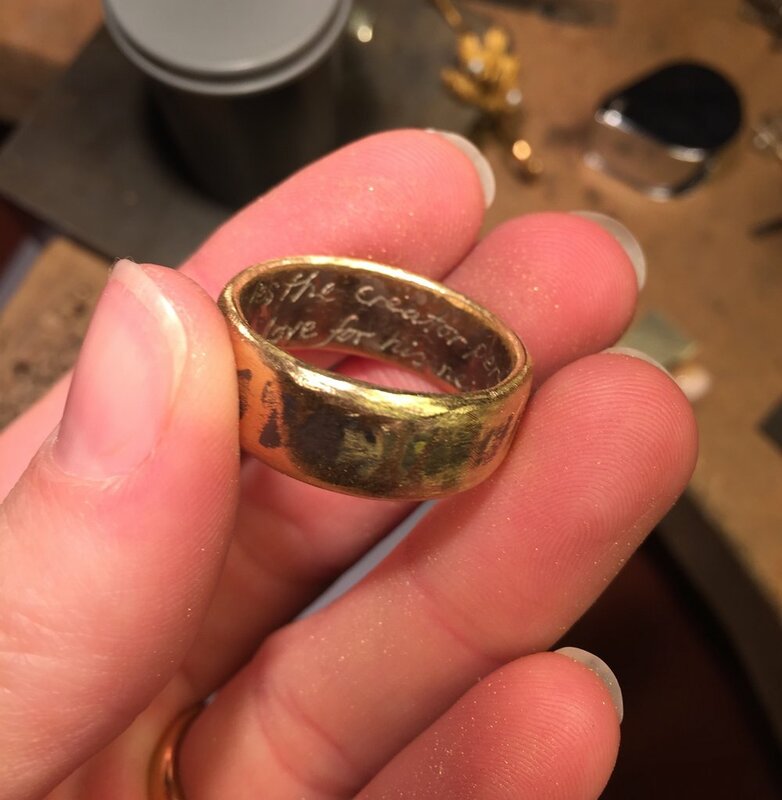 Checking the shaping and the freehand engraved quote inside the ring. Engraving directly over the pattern for the wild cat. The whiskers were added on freehand! Freshly engraved animals in a naive style; the faces of a grey seal and an otter. There is a grey seal, an otter, a red kite, a wild cat, and a tern. The animals are all native to the North East of England, and all appear in the stories of St Cuthbert as his allies and animal guides. The ring is inlaid with twelve tiny faceted garnet gemstones which surround the animals in a scattered pattern, taking inspiration from the garnets inlaid into the cross pendant. Inside, the ring is engraved with a quote from Venerable Bede, who was almost a contemporary of St Cuthbert. It reads in a continuous spiral; "he alone loves the Creator perfectly, who manifests a pure love for his neighbour." The finished ring, on the wall next to our studio. Showing a naive red kite with wings outstretched and several of the inlaid natural garnet gemstones. The statement below was actually included in Hannah's submission to the Cathedral, and beautifully explains the message of the ring, and the honour and privilege she feels when creating something so deeply symbolic. Although I haven’t been christened or confirmed and don’t take part in formal religious worship, when I enter a consecrated sacred space which has stood for hundreds of years, I cannot help but feel extremely moved. I am in awe that our ancestors had the vision, strength and dedication to build such colossal monuments to faith - to love. 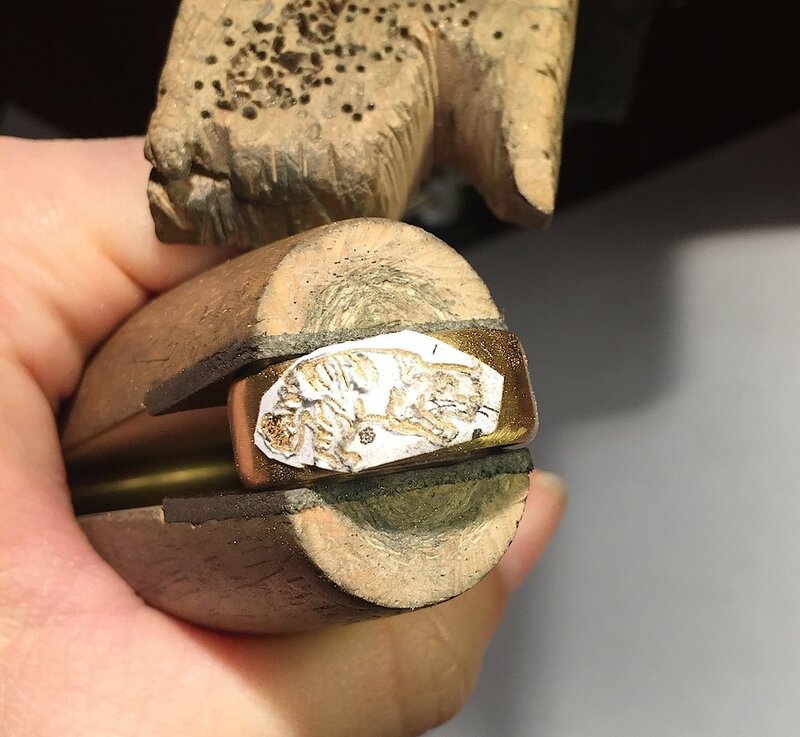 As a jeweller, when someone asks me to make their wedding ring I feel an incredible honour. Of all the thousands (millions?) of wedding rings which exist in the world, they have chosen me to create it for them. This small circle of gold to be worn on their finger (traditionally the finger linking a main vein directly to the heart) every single day for the rest of their lives. A symbol of their love and commitment for another human being. Rings which I particularly enjoy making are those which some people call ‘ancient’ or ‘archaeological’ in style. In my work do not seek to ape what has gone before, but more to give historical precedents a fresh interpretation by bringing a new visualisation to life. For this commission, I am proposing to create a new ring to be displayed alongside (i.e. in the same case) - as the older treasures of the Cathedral, the ring being a powerful and universal symbol of love and devotion. A ring inspired by medieval episcopal rings, taking reference from St Cuthbert’s gold ring which encloses a sapphire, the gold Cross of St Cuthbert set with garnets, the style of the carved figures on the Coffin, and St Cuthbert’s love for animals. 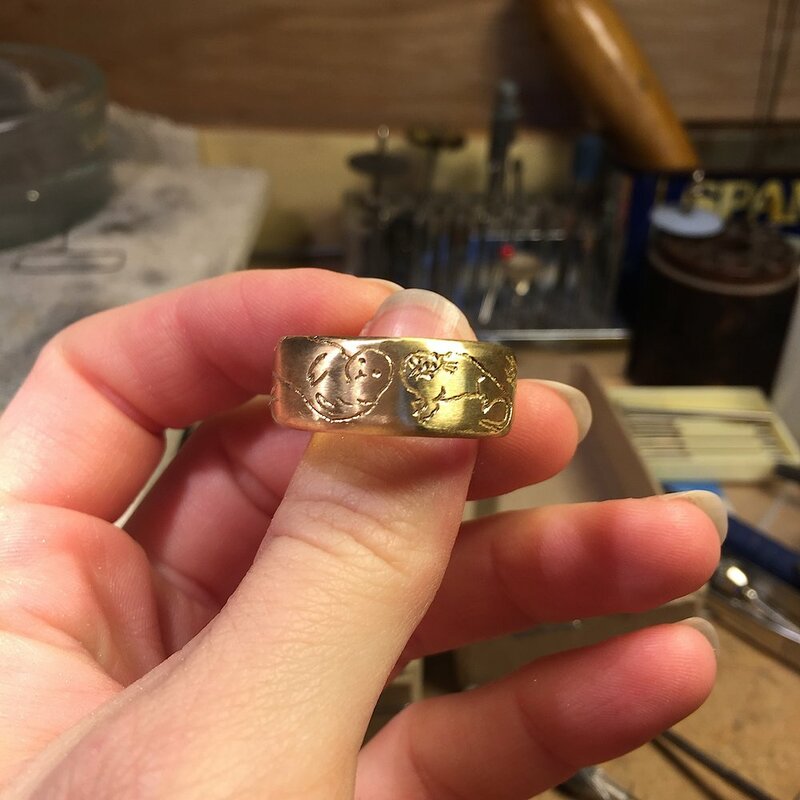 A ring incorporating aspects of previous rings I have made in the medieval style (please see annotated visual information, enclosed in this pack), with particular emphasis on the hand-engraving. The ring would be, like all my rings, entirely handmade by forging and hammering a flat piece of metal. Any stone settings would be hand-fabricated, and all engraving would be done freehand. The techniques I use highlight the importance of safeguarding traditional skills. It is my intention that this ring would be used as a tool to facilitate new ways of thinking about the Cathedral, its history, and its Treasures, perhaps in the context of love. There are many ways in which this could be done, but some examples could be: visitors could be prompted to think about notions of commemoration and celebration in their own lives (in the context of the Cathedral and the ring), or visitors could reflect upon the significance of their own rings (or those of a relative) and their own stories of love and commemoration. With a deep personal interest in antique jewellery, I love to imagine the stories which old rings could tell if they could speak; A wedding? A birth? A death? Significant life events which are celebrated and commemorated by the Christian Church and religions throughout the world. You can find out more about Open Treasure and plan your visit to see the treasures of St Cuthbert, via Durham Cathedral's website.